Stories concerning Robin Hood, the heroic outlaw of English folklore, likely circulated long before they were written down. This collection contains four anonymous poems about Robin Hood all dating from the fifteenth and sixteenth centuries. 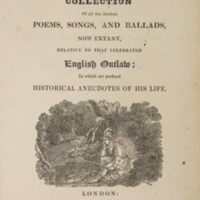 Interestingly, the editor of this collection, Joseph Ritson, includes a biography of Robin Hood, regarding him as an historical person rather than a fictional creation. 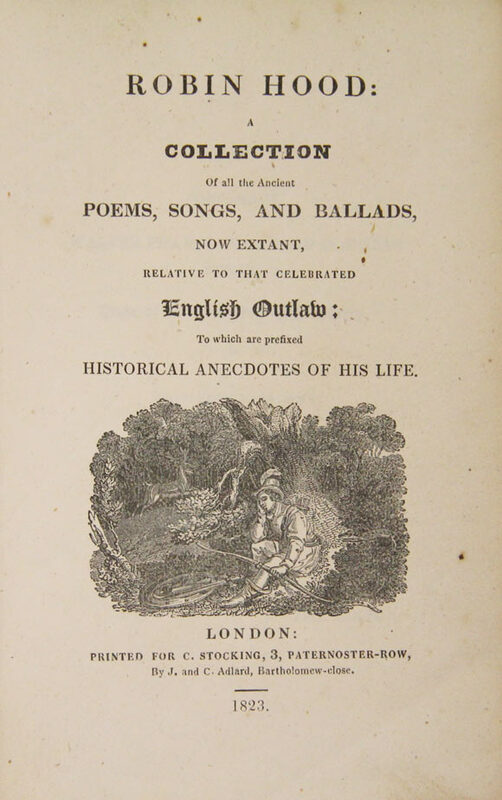 “Robin Hood: A Collection of All the Ancient Poems, Songs, and Ballads, Now Extant, Relative to That Celebrated English Outlaw: To Which Are Prefixed Historical Anecdotes of His Life, edited by Joseph Ritson,” ourheritage.ac.nz | OUR Heritage, accessed April 22, 2019, http://otago.ourheritage.ac.nz/items/show/6420.